I am planning to intercrop moringa between 1.5 year old arecanut plants near Hiriyur. From Tumkur / Bangalore market point of view, which Variety of drumstick is better Bhagya / PKM-1? I was told Bhgya gives better yield than PKM-1 and its length being medium size, better for transport and market. Can i plant drumstick in between two Arecanut plants - effective spacing of 3.5 feet between Arecanut & Drumstick plant ? Arecanut plant spacing is 7 feet between plants and 9 between rows. I have been trying to do agri for the oast eight years and incurred massive losses. I surely agree with the farmer who you are squabbling with that you get little from government institutions and even departments. And, i also know that what ca be done by institutions in a small area with all funds and students available for working and testing etc cannot be replicated by a farmer. So, government people need farmer perspective. Talk of practices that are practical in the farmer’s fields. The one who has personal practical experience is way higher than the one who states from books. My only reason to write this from such acrimonious language that you have written. This is plain stupid. How is it that one doesn’t need cyclic market data? And another question that was addressed so strangely is when the other guy asked for references where someone is getting the yield that you mentioned. How could you just push it under the carpet? If what’s written by you is true then it should have been done in the field. I’m from HP and don’t intend to do this farming. I had read somewhere that in aquaponics moringa is a good food for the fish. So i got interested in reading this. I’m spiritualist and don’t intend to kill fish for my food. And i was told that fishery and aquaponics will be profitable. So, i was working on something that could give me a cheap alternative to fish food so i could think about aquaponics trial. Anyhow, i request you, dear friend, to keep it to civility level. This is no way to reply that I’ve not read your post and still mention something from the post. If you have data with you then you don’t have to be so belligerent in your defence of the points you mentioned. Experience data is a must and all that you are talking about is based on data collected by those who developed this moringa cultivar. Without data even you shouldn’t touch anything and advise anybody how much so ever well read you might be. I’m saying this because i was enticed into this field by such calculations as you have written. They never worked even with those experts as my consultants. Moreover, I’ve found that this industry is infested with cheats. And if you put a case it takes decades. I was cheated by someone in 2010 and I’m still fighting the case. Farmers don’t have the habit of keeping proper records being gullible as they are. And they find difficult to push their case. Moreover, courts are another menace. So, again i say, what’s on paper is not in experience. So, pl encourage people sharing experiences. That will help than any paper talk. Paper tigers remain on papers only. This month end i have planned to plant drumstick odc vrty in my land.Pl kindly suggest to me this month is the ideal period for drumstick planting,if we got heavy rains in my area means how i can rectify.Soil type is red soil, seed or saplings which one is the better fro drumstick growing sir. You cannot plant Nugge in Adike with the spacing you mentioned. Even otherwise no nugge in adike. Bhagya is better for any market because its length, taste and colour with yield. I want to farm drumstick for pod at Nashik, Which variety I should choose ? Shall I plant at January? Shall I plant seed and develop the farm or shall I plant cutting? If possible please call me at 7045125050. I am Sangappa R Dasar (Mob: 8943458659) from Vijayapur (Karnataka). I have 5 acres of dry land. Black and bit whitish and less fertile sand. I have planned to plant moringa to this land. Rainfall is very less and In summer temperature will be around 40-degree Celsius. Please, Can you suggest me, How to proceed (I have a little bit of knowledge about moringa cultivation)? and also the availability of seeds. I am interested to grow 3 acres of ODC, pkm1, and pkm2 each acre. I have enough cow manure. This is Kailash from Sri Lanka. Great read, very informative I must say. I have a few questions for you. Is it advisable to give chicken manure fertigation every week, or is it too much Nitrogen for the tree? Why have you specified to plant on during certain months, will it not grow well during other months? Is PKM 2 a good variety to start with? Perfect guidelines, professionally explained. Thank you very much for wonderful guidelines. REQUEST: If, I want to make a nursery for PKM1 in this week (September) month, is it suitable. I’m from Maharshtra. Pls advise. Better select Bhagya of Bhagalkote University or Rohit from MH. You can go ahead. Better choose to sow seeds directly . I am from indore madhyapardesh now in second year of moringa cultivation ODC variety. 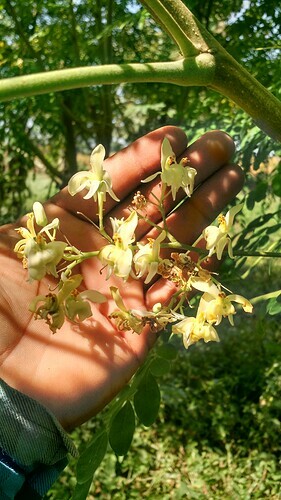 Pls guide me in controlling pests in moringa, my moringa plants have started flowering recently. I will be interested in both organic and chemical options. Please advise on Moringa Plantation, I am planning for the same at my native in Tal.Khed,Dist.Ratnagiri, Maharashtra. This area falls under heavy rainfall area namely Konkan region,the land identified is well drain. 1)Please advise on variety selection for both pod & leaf production options available-PKM-1,ODC from Gujrat seller,Konkan Ruchira Developed by Dr.B.S.K.K.V., Dapoli. Thank you very much this article. I read from the article that 888 plants per acre which is about 6 plots of land will produce approximately 20MT seeds per Annual, please can you explain if this per annual is once harvested. Becuase I read another article online that stated Momax3 will give 8Tons of seeds. My understanding is that Momax 3 are more productive than PKM-1 and PKM- 2. Please I need to clarify this, as my father is a farmer, that I wanted to invest on Moringa farming of 10 acres for him. Please sir assist with some information.